Sharing Two Kindles, How does it work? My wife and I both like to read. I recently got a Kindle, and Holly just had to have one too. One downside of e-books is that you can’t share a book with a friend. However, if two people can share one Amazon account (at least, just for Kindle purchases) , then they can share all their books between their two Kindle’s. It works really simply, and really well. When you get the second Kindle, you just register it to the same account as the first one. Then when you buy a book, or download a sample, you get a drop-down box that lets you choose which Kindle you want the book sent to. 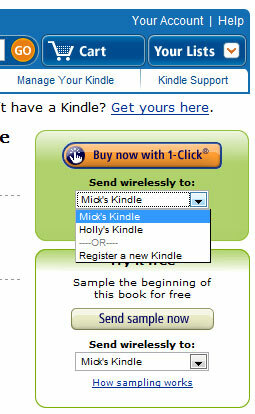 In the image to the right I’ve selected “Mick’s Kindle”. So it gets sent to whichever Kindle you like. There’s no option to send it to both Kindles, but once you’ve bought it, then it’s in your “Media Library” on Amazon, and from there you can send it again to either Kindle. You can also buy books on the Kindle itself, and with that it works just as you would expect – the book goes to the Kindle you ordered it on, and to the Media Library, so it can be downloaded to either Kindle at a later time. Finally you can also get a copy of the book on the other Kindle without using the computer. Just go to the “Content Manager” on the Kindle’s main menu. In the Content Manager, some books are labeled “Kindle”, meaning they are in your Kindle, and some are labeled “Amazon”, meaning they are just in your Media Store. If Holly buys a book, it will automatically show up here. So, to download a book Holly just bought on her Kindle, I just select it in the Content Manager, and then select “Move to Kindle Memory” from the Menu. The book will transfer, and twenty seconds later you can start reading. This all brings me to an unexpected advantage of the Kindle. We can read the same book at the same time. Normally you’d read a book and then lend it to someone. But since we have two Kindles, with two copies of the book (for less than the price of one paper book), we can both be reading it at the same time. We are currently both reading What is the What by Dave Eggers, and it’s a novel experience to be able to discuss the book while were are both still reading it. I don’t think so. A kindle has to be registered to a particular account. So the books might stop working if you change accounts. I’m not entirely sure though. Is there any way to transfer books from one account to another? No. Books are always on the same account. To get a book on anoother account your would have to re-purchase it. I have two kindles now. The Kindle 2 was on one account and now I have registered Kindle 3 to the same account. I am not able to see the books from Kindle 2- what am I doing wrong? thanks for the initial post here. this was the exact answer i was looking for, as i am looking to get a K3 for my wife. the only issue i forsee is the furthest page read syncing issue. however, if we maintain never reading the same books at the same time, i dont see this as an issue at all. Thanks for the warning that if you un-register an account (#1) in anticipation of re-registering it with another Kindle account (#2) so you can transfer books, Account #1 will loose his/her books. I’ve been thinking of doing this and was wondering if there was a downside. Very good information Mick. Am I right in assuming that the sharing of books on the Kindle works the same way with the Kindle App for the Ipad? Yes. In fact I read mostly on Kindle iPad now. I just got the Kindle with free 3G. I want to get my husband one so we can share books. My question is, does he have to have the free 3g as well or can we get him the Kindle for $139? Thanks very much. You can share books just the same with WiFi, so long as you both have the same account. We share books between Kindles, iPhones and iPads, the type of device makes no difference. Very interesting. I have relatives who are doing this with 3 kindle devices. Has anyone asked Amazon if it’s OK? If they say it’s OK then I’m happy about it and I’d like to do it. I read the end user agreement and got the impression that when they use the words “you” and “your” it was singular, not plural. Until Amazon says it’s OK it sounds wrong to me. It’s a poorly defined legal area that’s currently going through a lot of discussion. I suspect you would have to wait a long time for an answer. My wife and I equally own all our kindles, computers and iphones. Consider what would be the case if we only had one Kindle? Would anyone argue then that we were not able to share that one single Kindle? While there’s an obvious practical difference to extending that to two Kindles, it’s not at all clear if there’s any legal difference. If I have two kindles, then at what point does letting my wife look at one of them constitute a “violation” of the licensing agreement. This (family sharing an account on multiple Kindles) is currently a very common practice, and it seems highly unlikely Amazon would explicitly attempt to restrict it. They would probably not want to explicitly allow it either, as their lawyers might argue it dilutes the licensing agreement in general. It’s an interesting legal debate, but for practical and moral purposes I see no reason my wife an I can’t share an account. I was recently reading the manual for my kindle and I saw the instructions about creating folders and syncing them to multiple devices. In the instructions, I remember seeing the labels on each kindle and one of them had one person’s name and the other had another person’s name. Seems like Amazon understands that people in a household would likely be sharing books. It’s like with itunes, if I install a cd on my itunes that I own, my husband can also install it on his itunes. It belongs to both of us. As a couple, you don’t have to own two copies of every movie, book, or cd you own to be ‘legal’ Why would would ebooks be any different than a real book? They are different because there are no physical limitation on making copies. Kindle have recently introduced a “lending” feature that brings back a bit of what you had with physical books, although somewhat more limited. My wife and I both have a Kindle with books on them. They are currently on separate accounts. Is there a way to combine both on one account so we won’t loose books alreaty paid for? Don’t bother answering as in reading all the information above I understand the answer to my question is no. Thanks for doing all this work. The information is very informative! My husband and I are enjoying our Kindle. It’s good to know that we can share. Thanks for letting us know Mick. We have two kindles that share the same account. Somehow my books are now on my husbands kindle and he says he doesn’t mind, but we don’t always read the same books. My question is, is there a way to take those books off of his kindle without deleting them from mine? Probably a dumb question but….. I’ve got an iPad but find reading books very difficult; if I buy a Kindle can I copy books from my iBooks and Kindle libraries onto a Kindle as well? Thanks for any info, I don’t want to buy a Kindle and then find I have to repurchase all my books!! You can transfer the Kindle books, but not the iBooks books. I’ve just registered the second kindle I bought for my wife liz and now when I look at buying a book the only option I get is to download to Liz’s Kindle; mine has disappeared. Have i registered liz’s over the top of mine instead of registering a second kindle? Bob, hard to tell what’s going on there. I’d try to un-register and then re-register the first kindle. Or do it to both at the same time (so you know you are doing the exact same thing on both). My wife has bought a kindle for our 12 year old daughter. We’d like our daughter’s name to appear on the kindle, but to have purchases made to my wife’s account. How do we do that? Currently, the kindle says my wife’s name, which is not what we want. Thanks for posting Mick! Might I ask why you use your iPad to read now rather than your Kindle? Actually I’ve gone back to the Kindle. The iPad was great as a multi-purpose device, but it was too heavy. I’ve got a Kindle 3 now. It’s great. Just curious…I bought my 9 year old daughter a Kindle Fire for Christmas, and it put all of my library on her KF. I would like to take off some of my books. Is that possible? Can you transfer books between two kindles without them being attached to the same account? No. When you buy a book it’s attached to your account. However with some books you can “lend” it to another account for a period of time. This varies by book, and probably by country. Can purchased tv shows and movies be shaed between kindles the same way the sharing of books is being outlined? I have a kindle and have brought my two kids one each and my wife when I download games will it download it to whoever’s kindle we are using at the time. Copyright © 2019 Mick West. Powered by WordPress and Drop Shipping.